Gibbon Falls, on the Gibbon River between Madison Junction and Norris Geyser Basin, is one of the most stunning waterfalls in Yellowstone National Park. Gibbon Falls marks the point at which the Gibbon River flows off Yellowstone’s northern escarpment and drops into the Park’s lower volcanic caldera region. Many descriptions of Gibbon Falls state how uninspiring this waterfall is viewed from the road, or how crowded the roadside pullouts are, or complain-whine-wahwahwah. What these folks don’t realize is that it takes a little bit of work to get to the most best vantage point. Most visitors see Gibbon Falls from the pullouts on the road above the falls, which do not offer a good feel of the power and beauty of this waterfall. Instead, at the lower of the two pullouts, park and hop over the wall. With boots or good shoes, slide-jump-tumble-hop down the dirt hill to the river, then follow the fisherman’s trail up the river to the foot of the falls. Yes, you’ll get some dirt in your shoes and then they will get soaked in the Gibbon River, since there are a number of spots you’ll need to wade across the river as you move upstream. In summer the river is warm and the knee deep walk through the whitewater is lots of fun. Use your walking stick or tripod to keep your balance, and put your camera in a dry bag, ziploc or whatever. You may find yourself accompanied by one or two fly fishermen as well who generally have this section of the river all to themselves. The fellow in the photograph was catching lots of tiny little trout-something-or-others and letting them all go. For photography, the best time to shoot this is midday, since at that time you’ll have the entire falls lit evenly with no shadow or contrast problems. 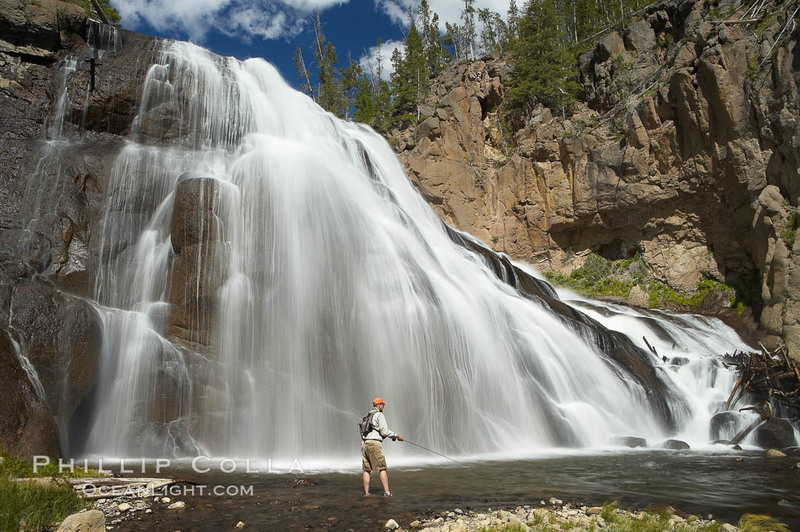 Keywords: gibbon falls, gibbon river, waterfall, yellowstone national park.